As soon as you break out the eggnog, the time has come. It's the holiday season. 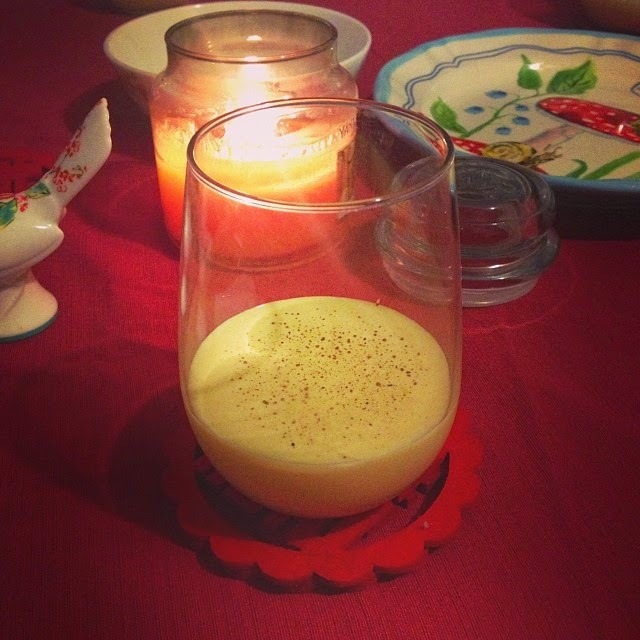 We had our first eggnog over at Colin and Victoria's house, sprinkled with nutmeg and all, and it was like a big whoosh! Here come the spices, the cinnamons, the pumpkin spice lattes, the winter time, the desserts, the festive feelings, the Christmas. 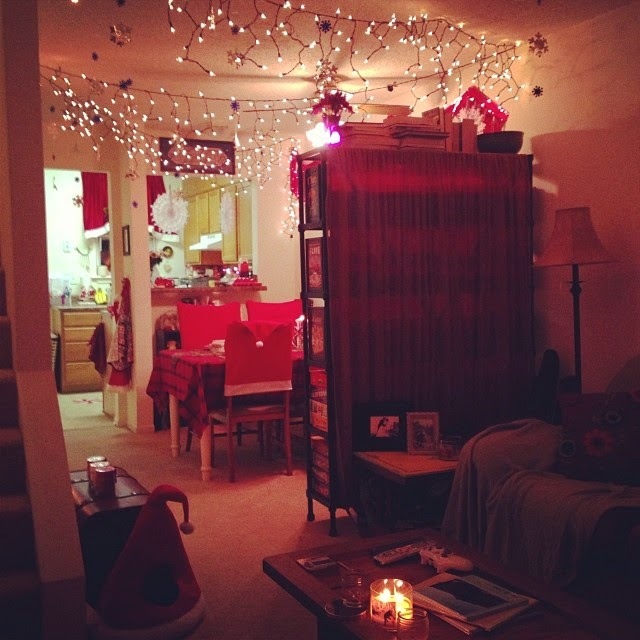 Obviously Thanksgiving comes first, but in our household, there's a thing called Winter Wonderland. You see, Winter Wonderland can't be rushed, thrown up and torn down between December 1st and January 1st. It's a thing to be savored, it's a feature. It's grand and mighty and yes, it supersedes Thanksgiving. Winter Wonderland is a commitment. I spend weeks beforehand, shopping online and adding things to my wishlist, carefully eliminating the unnecessary (let's be honest, all of this is unnecessary -- but sometimes the unnecessary things are the most fun!). This cat bed was by far my favorite purchase. Luna spent a lot of time in it this winter, and it was seriously the cutest. By the time I had WW'd our apartment, it was pretty legendary. Let us take a tour, shall we? I think I really outdid myself this year. Granted, it was easier, because I had the basics from last year still in our collection. I can only imagine what Winter Wonderland will be like in ten years! So that was the downstairs. Glowing, cheery, detailed, crazy. I did a little bit of decoration in our bedroom last year, but decided to kick it up with a notch with some upstairs bathroom decorations, and some more in our bedroom! I loved this giant red Santa shower curtain, and Dusty has always loved penguins. Our bedroom was the best. Man, I love Christmas. Like last year, I did all of this in one day, while Dusty was out of the house studying. It's a really fun surprise (and a lot of work, I think I went through 8 Christmas movies), and something that I'd love to continue in the years to come. I think in the future it'll have to be something he helps me with, though, but hopefully I can still whip up a few surprises here and there. Haha! 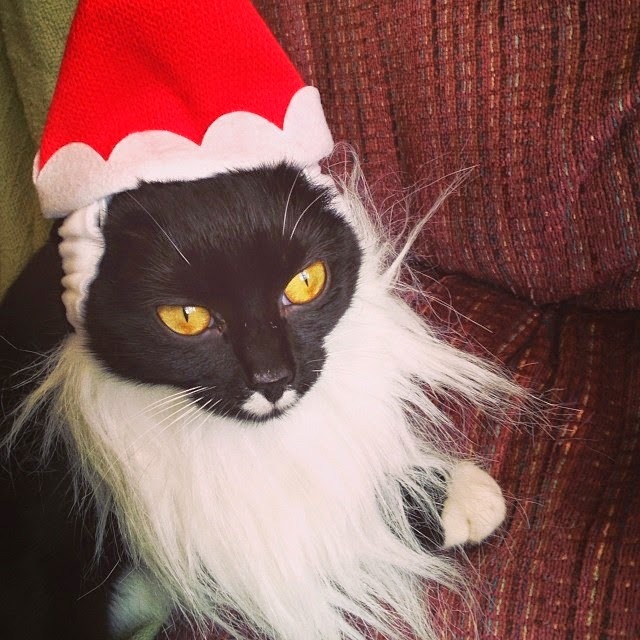 Dusty has always joked (or maybe he's secretly serious -- I can never tell) about dressing our cats up in costumes, which I think is an absolutely horrible idea. I'm already enough of a cat lady, I don't ever want to cross that line into calling our cats my children and dressing them in dresses and hats. 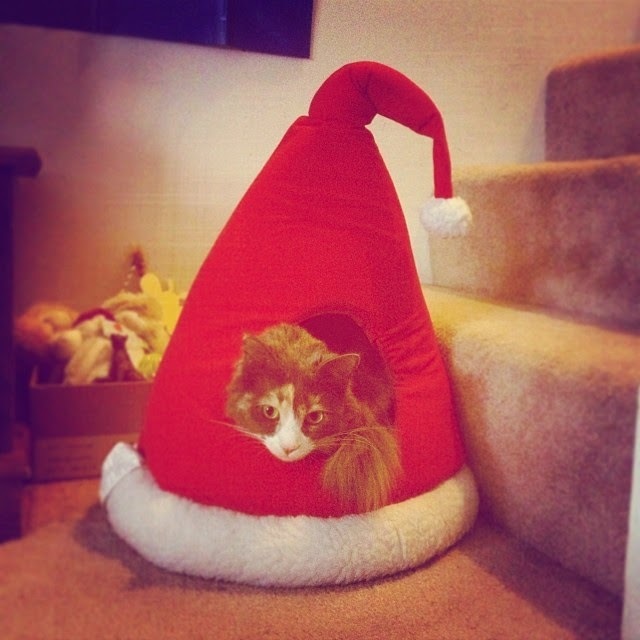 So while he was studying intensely that afternoon, I went to Target to run some errands, and saw this santa hat for $5. I couldn't help it. I'm sorry. I grabbed this photo of Eva and sent it in a text message to Dustin, and pretty much made his entire life. When he got home that night we were able to set up and decorate the tree, which was the cherry on top of a great Winter Wonderland weekend. I made caramel-filled apple cider cookies, served with cold eggnog, and we watched Love, Actually (which he had never seen). One of the best things about setting up our tree is pulling out all of the new Christmas ornaments we've collection over the year. We love to try and get a Christmas ornament whenever we travel somewhere, so this year we were able to add Paris, London, Charleston SC, Blowing Rock NC, and a few others! Some of the new additions included a handful of Harry Potter ornaments my dad got for us. Since this was our very last Christmas in Virginia, it was pretty bittersweet. Our first Christmas here was really simple and fun, and our second was the introduction of Winter Wonderland, and found us much more at home in Lynchburg. Both of those years we set up our tree, and had little mini-Christmases with just the two of us before heading home to Arizona for the actual holiday. This year was different, because we were spending the actual holiday in Virginia. The first and only time we've ever been away from Arizona for Christmas. Luckily Dusty's family was going to be visiting, which would be wonderful! But it was still a big deal for us. 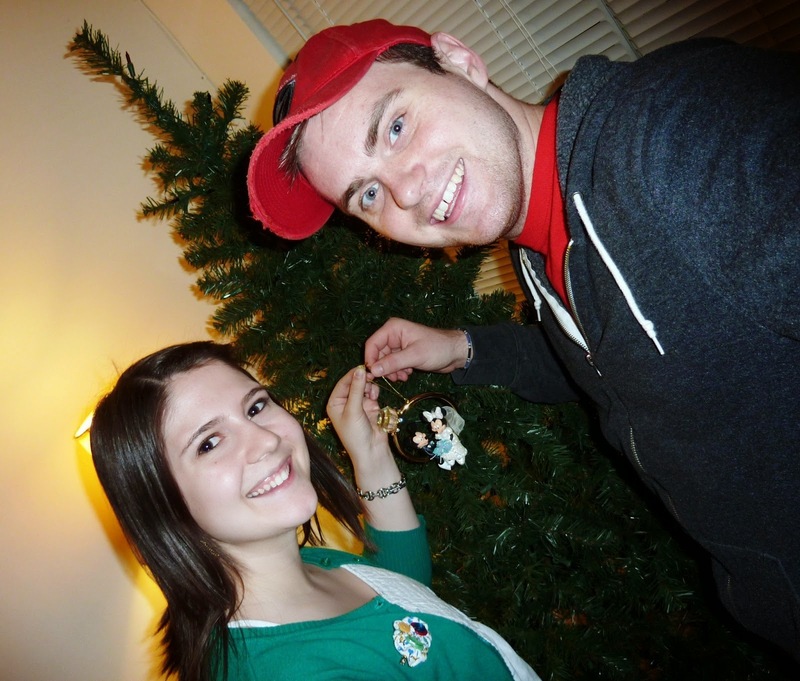 We still did one thing the same, though -- we always start our tree with the first Christmas ornament we ever received, an engagement Mickey and Minnie ornament from my brother and sister-in-law. Our tree is now a sad little crumpled thing, which we will be throwing out after this year. It has been a climbing post for our cats, mostly, but it has served us well, in allowing our home to be the Winter Wonderland that it is.